Comprehensive review of Best Nest Wellness Mama Bird AM/PM. See what real experts and actual users have to say about this prenatal vitamin. Having never heard of Best Nest Wellness Mama Bird AM/PM prenatal vitamin, I went into trying it with a completely open mind. From a company that has a 100% money back satisfaction guarantee, I had high hopes of loving this vitamin. After analyzing the ingredients and using the prenatal, I was slightly disappointed in both the ease of using it and the ingredient amounts. For those reason and more, I gave it 2.5 out of 5 stars after trying it out. While there is flexibility in when you can take this prenatal vitamin throughout the day, the pills are pretty dry and slightly large, making them more difficult to swallow than other vitamins. They also leave you with some nasty burps throughout the day, which is definitely something I try to avoid with any supplement I’m taking. When it comes to the ingredient list, this vitamin doesn’t leave anything off, which is a major plus, but they do fail to put the full recommended daily amount on some major ingredients, which is never good. They also include red raspberry leaf as an ingredient, which could give many moms a reason to pause before using it as that ingredient has been linked to inducing labor. As a more expensive prenatal vitamin, and with a few strange quirks about the vitamin overall, I think Mama Bird AM/PM prenatal vitamin is one that may not be a great fit for many expecting mother and their babies. Mama Bird AM/PM prenatal vitamins are both easy and challenging to use, depending on how you’re looking at it. On one hand, this prenatal is super easy to incorporate into your daily routine. You have to take two tablets a day, but you can decide when you want to take them, if you want to take them together or split them up, and whether you take them before a meal/snack or not. As someone who is always on the go, I really liked that aspect of it. For me personally, it was easiest to take them together before breakfast since that’s when I always take my vitamin, and was therefore easiest to remember then. But if you’re a little less routine-based, having a flexible schedule with the prenatal is really nice. On the other hand, however, these pills are slightly large, and don’t have any sort of smooth coating on the tablets, so they are a little more challenging to swallow. They have that dry feeling to them, if that makes any sense. I made the mistake of trying to swallow them both at once, and it felt like I had a pill stuck in my throat all day, which is the worst! So I would recommend swallowing them one at a time, and having plenty of water to guzzle them down with, since they’re harder pills to swallow. Since you swallow this tablet, you don’t get too much of a taste when taking Mama Bird AM/PM prenatal vitamins. When they are sitting on your tongue briefly, they definitely taste like a vitamin. No real obvious flavor, and they don’t taste good, but they don’t necessarily taste bad either. Unfortunately, this is one of those vitamins that taste gross when you burp later. After I’ve taken this, even hours later, I’ll burp and there will be a gross vitamin, even slightly fishy taste, in my mouth. It isn’t super overpowering, but it’s definitely there, which I don’t enjoy at all. I had never heard of Best Nest Wellness before, so I was intrigued to see how Mama Bird AM/PM prenatal vitamin stacked up compared to others on the market! After analyzing their ingredient list, I was a little disappointed in some of its shortcomings. On the positive side, Mama Bird AM/PM prenatals have 800 mcg of Folate in it, which is the perfect amount. However, just make sure you take note of the fact that it’s in the form of Folate, not Folic Acid. If you prefer one form over another, make sure you’re paying attention to that ingredient specifically. These tablets also have a great amount of Vitamin A, Thiamin-B1, Riboflavin-B2, Niacin-B3, Pyridoxine-B6, Biotin-B7, B12, Vitamin C, Vitamin D, Vitamin E, and Zinc. The inclusion of all these vitamins, and at the correct dosage, is so key to a healthy mama and baby! For example, Thiamin-B1 aids in the healthy growth and function of the baby’s brain, heart, and muscles, and Roboflavin-B2 help the baby with proper growth, healthy skin, and good vision. B2 also helps with energy production for mamas, so you know we’re all looking for that, especially if we already have little ones running around the house! The negative aspects of Mama Bird AM/PM prenatal vitamins are that they’re low in Choline, Iron, and Iodine. Iodine specifically is crucial for a pregnant mama, because most foods have a relatively low iodine amount, so finding a supplement with the right amount is key. Iodine helps with the development of the central nervous system (CNS) of the baby, including their brain and spinal cord, so I’m really bummed to see that this was low. This prenatal is also super low in Calcium. It’s obvious why calcium is good for both mom and baby during pregnancy. However, there are a lot of other sources of calcium in foods, so this is slightly more forgivable than the other ingredients listed above. Finally, and this may be getting nitpicky, but these prenatal vitamins are slightly low in Vitamin K, but just barely below the Recommended Daily Amount (RDA). I only bring it up because Vitamin K is essential for healthy blood clotting, so you definitely want to make sure you’re getting enough. In additional to the core ingredients in Mama Bird AM/PM prenatal vitamin, Best Nest Wellness also included an Enzyme Blend, Organic Wellness Blend, and a probiotic. All of this seems to be a great addition, but one of the ingredients in the Organic Wellness Blend is organic red raspberry leaf. I know Raspberry Leaf Tea has been said to induce labor. While I’m sure this ingredient is safe, you may want to ask your OB before taking this prenatal, or reach out to the company directly. Overall, I’m not overly impressed with the ingredient list. I think they get most of it right, so it’s definitely not a total flop, but they fail to meet the RDA on a few key vitamins, and the inclusion of red raspberry leaf gives me reason to pause. I didn’t experience any negative side effects while I was taking Mama Bird AM/PM prenatal vitamin, so that’s always a major plus! Priced at $30 for a 30-day supply, Mama Bird AM/PM prenatal vitamin is more expensive than other prenatal vitamins on the market. I definitely think it’s still a reasonable price, but if you’re looking for an affordable option, this might be one you pass on. After analyzing the ingredient list, I’m not sure these are worth the cost. I think they are low in a few too many ingredients to justify spending a dollar a day on them. Best Nest Wellness has an awesome return policy. It says on their website that they have a 100% satisfaction guarantee, so if you aren’t happy with their products, just reach out to them for a full refund! Since these prenatal vitamins are a little expensive, I think that’s a really nice aspect of the company! 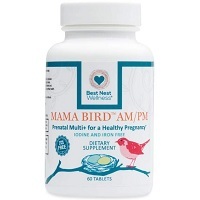 To buy Best Nest Wellness Mama Bird AM/PM Prenatal Vitamin, click here.